Hello everyone!! Hope all of you have had a wonderful week!!! We are finally calming down here...the grands have all gone home, the sheets are all washed, kids stuff put away until Christmas break, dusting, sweeping, and bathrooms all cleaned...phew!!!! Now it's time for a little me time....Woot!!!! I will finally get to play in the craft room during office hours and not during the wee hours of the night/morning...LOL!!!! Anyway....it's Wednesday again and time for this weeks Color Throwdown Challenge!!! Lori has picked some bold and bright colors for us to play with....they look so pretty together!!! My card features the Cherish Every Moment stamp set from Taylored Expressions and the sentiment is from the TE Branching Out set. The image was stamped twice with Memento Tuxedo Black....the large flower was cutout, colored with Copics, and popped up over the other stamped image. The Sweet Sunday Sketch #231 was used along with a doily, ribbons, sewing, and embossing on the background layer. Remember, you don't have to use the exact colors.....use what you have as long as they are close to the challenge colors and be sure to add CTD305 to the keywords section when you upload your cards to an online gallery so we can find your creations!! You will find all the challenge details on the Color Throwdown Blog. Check out what the Color Throwdown DT has created for you today!! 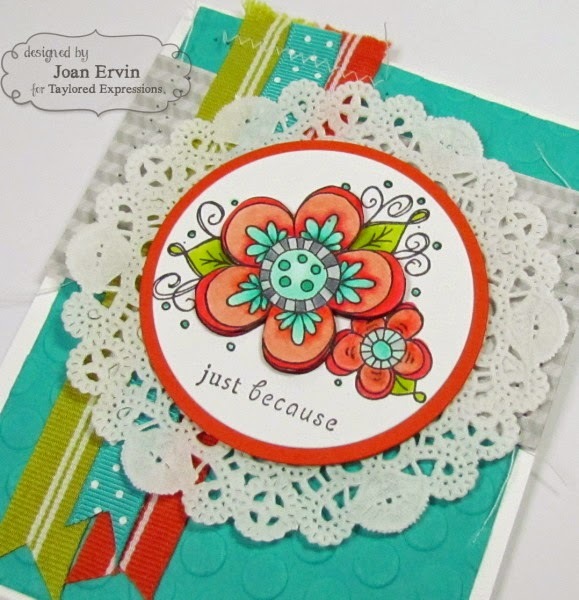 Joan Ervin - Stamping With a Passion - that's me!! Thanks for stopping by...have a great day!!!! 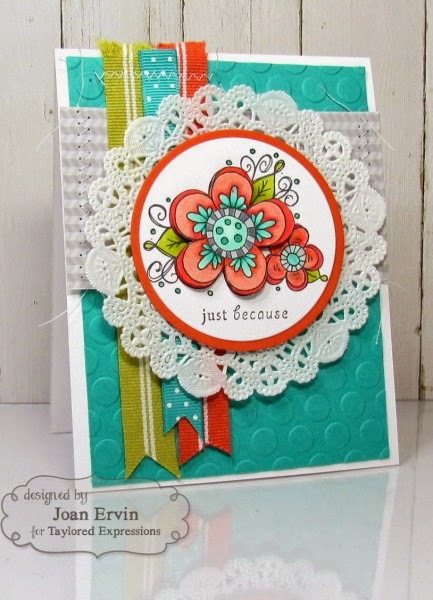 so totally gorgeous.. i love those flowers..
Fabulous card and color combo. Love how your colors just pop and the touch of sewing is a perfect touch. So cute! Love your vivid flower colors. Joan, this is so pretty. Love the colors and that big doily is just gorgeous! Love it! Hope you're having a good week! So pretty Joan. Love how the colors look on the flowers. The ribbon strips look amazing! This is absolutely gorgeous, Joan! Love those beautiful flowers, that are colored so perfectly, and I really love how you sewed the ribbon banners one!! Sweet card, Joan! Fabulous colors, and I LOVE the ribbon flags! So cute!! I love these colors! You've done amazing things with the colors, such a bright and cheerful card, love the flowers! Wonderful! Love the flowers and ribbon!! Eeeks...sounds like you did a lot of cleaning up after the little ones!! I need your energy! Hi Joan! Hope your summer is going well - guess you had the grandkids visiting for a bit! I love your beautiful layered bloom on this! these colors are lovely together! Wow! So pretty! Love the colorful flower, doily, and ribbon! Love this card! The colors on the flower are gorgeous and the ribbon are perfect (the doily too)! Thanks for your kind comment on my card - I've enjoyed guest designing this week. What an awesome card Joan! Wonderful job on this color challenge. I am not that good at them and you always amaze me how you pull them together so beautifully. Absolutely gorgeous take on these bold colors! LOVE your happy card! Hi everyone and welcome to my little corner of the world!! I started my stamping journey about 10 years ago when my DD Holly became a Stampin Up! demo. I wanted to help support her business so ten years and about a million dollars later, here I am!! I love to quilt, too, and we have three wonderful horses that we spoil like our kids!! Thanks for visiting and come back often!! Joan Ervin - that's me! I'm a Moxie Fab Challenge Winner!!! I'm a Moxie Fab World Trigger Target Winner!!! FTC Declaration: In accordance with FTC16CFR, Part 255, I declare that I currently receive or have received in the past products that I promote and endorse for free or at a discount from the following companies: Taylored Expressions, SCS, Rubbernecker Stamps, Clear Dollar Stamps, Gina K. Designs, JustRite Stamps, Flourishes Stamps, Unity Stamps, MFT Stamps, Inque Boutique. The products I use for my designs to display on my blog are recommended by me with the upmost honesty. I would not knowingly recommend or endorse a product that I feel is of substandard quality. Nor would I make misleading statements about the product to my readers.